Drawing individuals to your booth can be accomplished in a variety of ways including an eye-catching trade show display or big-ticket prizes. We suggest you can maximize your results by leveraging one of the hottest trends in promotional product industry – the fidget spinner. Not only are these giveaways sure to attract prospects, you’ll keep those prospects at your booth longer by teaching them tricks to take back to the office or home to the kids. The first trick is the basic spin. Get the spinners momentum spinning by holding it between your thumb and middle finger and spin it with your other and hand. Then carefully rest it on your thumb and watch it spin. The next easy trick, with a one star difficulty rating, is easy to accomplish by simply laying the spinner on the table or desk, holding the center with your index finger, and start it spinning using your other hand, accelerating it only three time to see how long you can make it spin. “Spin time” is the most important aspect of this trick. The third trick is called the “simple hand transfer”. This trick looks easy, however it takes some skill and you can show passersby how to accomplish this trick for beginners. First get the spinner spinning between two fingers on one hand. Once you are at maximum speed, gently toss the spinner into your other hand, catching it with two fingers as it continues to spin. Believe it or not, the trick to this stunt is bending your knees in the rhythm that you’re tossing the fidget spinner back-and-forth. The fourth trick is called the finger transfer. If we were rating these move on a five-star scale, the difficulty level for this one would be three stars. You actually start the spin differently – not in the traditional fidget method where your index finger is flicking the spinner to make it spin. You are holding it between your middle finger and thumb in a vertical position and then spinning it with your other hand to get maximum speed. 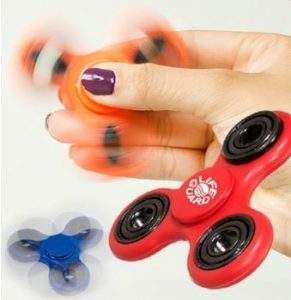 As the spinner rests on your middle finger, lift your thumb and then you pop it up and transfer it to your index finger while the spinner is constantly spinning. Similar to the previous trick, number five, the hand twist, ranks at three stars for difficulty. Once again you start spinning the fidget spinner in the same way as before to get the fidget spinning on your index finger. Then you completely turn your hand, first toward your body, then under your armpit and then extending toward the outside of your body. You are basically manipulating your hand around your elbow while keeping the spinner spinning. Trick number six starts by holding one of the fidget prongs and flick, flip or snap your wrist or hand to get it spinning as you toss it in the air. Then catch it at the center making sure the spinner continues to spin after you catch it. The concept for trick number seven is easy to understand, but takes some practice to master. Soon you’ll be teaching trade show guests the right way to “spin around the back”. Toss the spinner behind your back making it circle around your waist to the front and catch it with either hand. For trick number eight, you’ll need two fidget spinners to accomplish this trick called the “spinner swap”. Having two spinners will be easy because they are readily available! They are the giveaway that you are handing out to all those prospects at the trade show. Start the fidget spinning by using your thigh, your belt, a tabletop or any other surface where you can flick both fidget spinners at the same time to start them spinning. Remember to bend your knees in the rhythm of tossing the spinners back and forth at the same time from one hand to another. OK, we admit, the next trick isn’t necessarily dignified. But number nine is a pretty cool trick that everyone will want to check out. Get the spinner spinning on your index finger. Bend your head down and put the tip of your nose on the center of the spinner. Now the spinner should be spinning between your index finger and your nose. Next, slowly lean your head back, keeping slight pressure with your index finger, and then keep the spinner spinning as you let it go. Again, you are looking for maximum spin time at the end of your nose. The next trick takes the fidget spinner to the spirograph level. Insert a mechanical pencil into the center of the spinner. If your spinner does not have a hole in the middle, simply remove the plastic caps from each side of the spinner. Make sure the spinner is loose enough on the pen so that the fidget spinner will spin. Put the pencil in the horizontal position and start the spinner spinning. Once you have a good rotation, turn the pencil vertical with the lead pointing down (the spinner will now be horizontal) and you’ve created a top. Or use the flat top of a pen or pencil instead of the point of the pen or pencil. The eraser of a pencil or the level top of a non-clicking pen will work as well. For the second time, you will start the spinner spinning like the top, then you gently flick the pen or pencil. It will wobble and wiggle and then will self-correct and start spinning like a top again. The information included in this story thoroughly explains how to perform the tricks. Feel free to use these explanations in an instruction sheet to hand out at your next event or tradeshow. And if you need a little more guidance so you can easily teach attendees, or if you are more of a visual person, there are a number of trick shot videos littering YouTube that involve fidget spinners. Number 1 Trade Show Destination: Vegas!